Discover a new way to call Costa Rica affordably! For as long as you’ve been living in the US, you’ve been missing your mom’s gallo pinto. And no restaurant does it quite as well as mama. You know how to call Costa Rica and you love talking to her, but Vonage World® doesn’t include Costa Rica and you hate dealing with those pesky calling cards to Costa Rica. Think you’re out of luck? Think again. Consider this plan as a two-fer, as in a two-for-one. 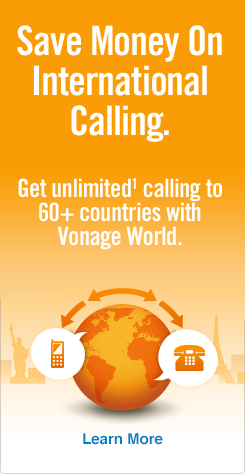 You get all the benefits of Vonage World, plus 100 included minutes to 9 Latin American countries and mobiles in 17! And because you’ve got A LOT of catching up to do, after you use your included 100 minutes to call Costa Rica, you still get great rates when you call each of the countries in the plan! On average, these rates are nearly 70% below the best per-minute rates from major home phone carriers. Vonage World Plus Latin America 100 gives you the chance to connect with family and friends back in Limon, San Francisco, or San Jose – without the worry. Check out all the countries in Latin America 100 and start talking and reminiscing with all those you care about.